Product #16197 | SKU CINSTUDMFT/UHD/2 | 0.0 (no ratings yet) Thanks for your rating! The Blackmagic Studio Camera 4K is a compact and lightweight broadcast camera designed for live production. Constructed from a magnesium alloy body, the camera is light even for travel, yet durable enough for use in the field. It has a large 10" LCD screen with detachable sunshade and an active Micro Four Thirds lens mount for compatibility with a wide range of lenses. 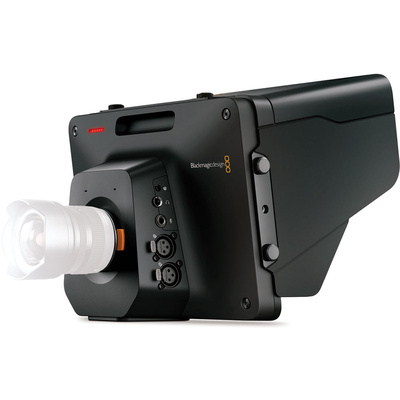 The camera also provides features you'd expect to find in larger studio cameras, such as tally indicators, talkback, XLR audio connections, 12G-SDI inputs/outputs, and even optical fibre via an optional module. Connections are grouped on both sides of the camera with video in and out (12G-SDI and optical fibre) and power on side, and XLR audio inputs, headphones, and LANC on the other. This lets you quickly setup and change cables as needed, while keeping them out of the way and protected during your production.